Join the call to stop the continuing human rights violations under the government’s counter insurgency policy specifically against enforced disappearances. 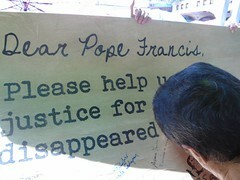 Join the call to surface all victims of enforced disappearances in the Philippines and in other oppressed countries. 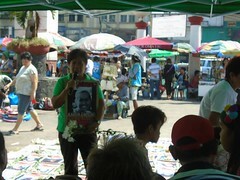 Join human rights organizations such as KARAPATAN, Ecumenical Movement for Justice and Peace and Hustisya in working to forward a campaign to stop all forms of human rights violations. 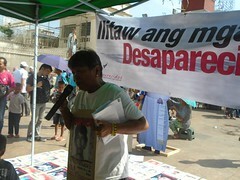 Push for the passage of a Law the will criminalize the act of enforced disappearance. Give material , financial and moral support to families of victims of enforced disappearances and other human right violations. Volunteer in activities of the Desaparecidos and join in their search and struggle for justice for victims of enforced disappearances.